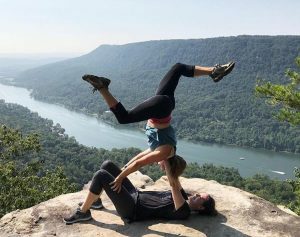 Join Chattanooga Acro Instructors as we introduce you to the magic of acroyoga in this donation-based class. Acroyoga combines partner yoga, acrobatics and Thai massage and allows you to explore balance and connection in new and fun ways. The acro community here in Chattanooga is vibrant and growing and we’d love to meet you! This is an all-levels class designed to meet you where you are in your Acro practice. No partner or experience necessary to attend! Suggested Donation is $20/person and can be made before class or at the studio. Aerial Acrobatics is designed to incorporate the balancing and stretching components of yoga with the strengthening and exhilarating components of Aerial Arts. This class will teach you climbs, inversions, and fun tricks to help bring you to thrilling new heights. It is not the therapeutic practice of Aerial Yoga. Aerial Acrobatics will be tailored to the participants and will include a yoga warm-up and stretch at the beginning and end in order for students to work on flexibility and conditioning as well as ensuring your safety. This class is appropriate for all levels of experience except those with heart conditions, those who should not be practicing inversions, and pregnant women. Subscribe to receive email updates of our special classes, promotions, seminars and workshops.